When photographer Dean Rogers acquired a dilapidated and dark warehouse loft conversion in Clapton, London, he enlisted the help of Sadie Snelson Architects to help him revitalise the space and transform it into a fresh and light filled open plan interior that combines working and living. In executing the renovation of a renovation, the team was met with the challenge of having to liberate the building from its former interior program. 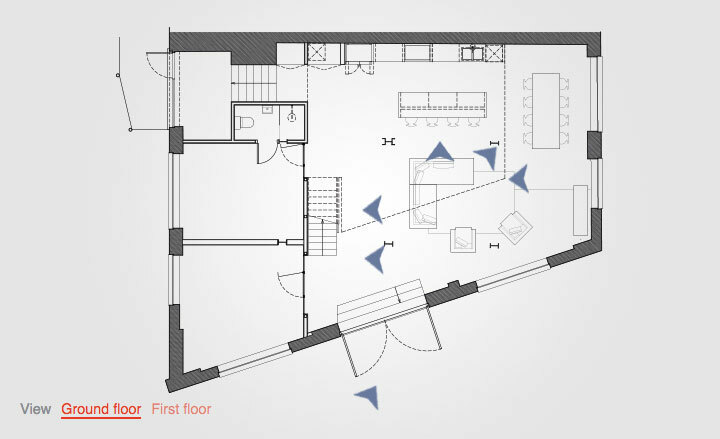 The space ‘was disjointed with small rooms and double height spaces at the perimeter, but had no large open area. It did not function very well’, says Snelson, reflecting on project’s beginnings. ‘The inner rooms were too dark. It suffered from damp problems, with condensation on the windows.’ In response, the architects removed most of the walls to maximise natural light and allow it to reach the full depth of the property. Rogers was after a sturdy space that would be bright and spacious with a double height ceiling, which would pay respect to the building’s original structure. As he often works from home, it was important to create a spacious ‘flexible working space’, accompanied by a series of smaller, private rooms destined for use as sleeping quarters and home office. The property’s industrial nature was fittingly highlighted through the new material palette. Each addition was meticulously chosen to preserve the building’s existing industrial interior elements. The walls’ ‘unpainted plaster finish’ is paired with a natural oak floor with an oil finish, and the existing interior’s dark iron beams offset the acid washed newly added metal elements. A striking folded steel staircase is one of the space’s key centrepieces. This was constructed in collaboration with manufacturer Diapo. It leads up to the newly added mezzanine, which is suspended from a rod in the ceiling and cantilevered out from an existing beam. Rogers, who was also contractor on the project, was heavily involved with all aspects of the build – even casting the impressive kitchen’s sleek concrete kitchen island directly on site. The result of excellent team work between client and architect, it is no surprise that this impressive project caught our eye – now, the Clapton Warehouse features in our ‘Raw Inspiring’ fashion story, featured in our April 2016 issue (W*2015).